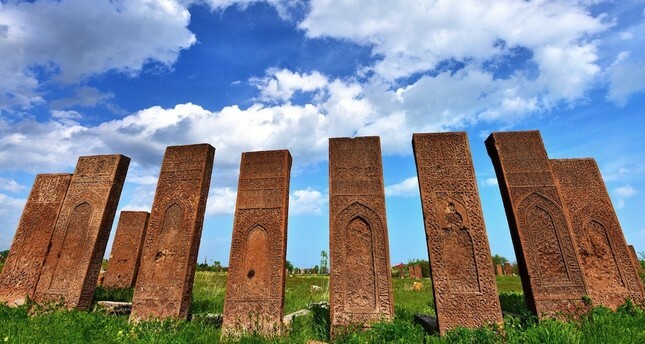 Considered an open-air museum for its Seljuk-era relics, including tombstones, cave houses, historic bridges and two castles, Ahlat has become the newest addition to the Cittaslow (slow city) network from Turkey. Located near Lake Van, Ahlat is the embodiment of "slow city" with people living in harmony and peace a stone's throw away from the chaos of modern life. The city is designed especially for cyclists and people in wheelchairs. With its history and exquisite flora, Ahlat has been a member of UNESCO's World Heritage List. Founded during the reign of Caliph Omar (581-644 A.D.), it flourished under Seljuk rule. The city bears the traces of its 4,000 years as a political stronghold and is home to more than 8,000 tombstones with engravings dating back to the Seljuk era. Following its accession to the Cittaslow network, Ahlat Mayor Abdulalim Mümtaz Çoban said that with this new title, Ahlat may become a frequent tourist destination in the future. Ahlat is located in Bitlis Province in the Eastern Anatolian Region. Known by its Armenian name, Khlat, in the ancient and medieval period, Ahlat is a major tourist destination in the region with its rich history with Mount Nemrut in the background. With the addition of Ahlat in the Cittaslow network, the number of "slow cities" in Turkey reached 17. So far, Akyaka and Köyceğiz in Muğla, Eğirdir and Yalvaç in Isparta, Gökçeada in Çanakkale, Gerze in Sinop, Göynük and Mudurnu in Bolu, Halfeti in Şanlıurfa, Perşembe in Ordu, Şavşat in Artvin, Seferihisar in İzmir, Taraklı in Sakarya, Uzundere in Erzurum, Vize in Kırklareli and, Yenipazar in Aydın have been included to the network. Based in Italy, Cittaslow is the term used for a"slow city" and describes places where people have a good life. Cittaslow is part of a cultural trend known as the slow movement. Its goals include improving the quality of life in towns by slowing down the overall pace, especially in a city's use of spaces and the flow of life and traffic moving through them.